"What good is a resume if nobody sees it? This site is amazing!" "I always said I would never pay for help finding a job, but when I realized how much time Resume Boomer would save me I changed my mind in a hurry. Thank you for a great service!" "Over 50 job boards? I only found 4 looking on my own. That alone was worth the money!" "In today's job market I needed every possible edge. After seeing my resume on one of the job banks, I got called in for an interview by a Fortune 500 company. I never would have made it this far without you. Thanks Resume Boomer!" "Your service saved me hundreds of hours! I can't believe how quick and easy it was to distribute my resume so widely. I have three interviews lined up already!" "Five interviews in two weeks! In five months on my own I didn't score any. Resume boomer was a life saver!" "I had almost given up on my job search, didn't know what else to do. Now I have three job offers and can't decide which to take!" "I would never have found all these job banks and job boards on my own. Resume boomer was a real life saver!" "Who knew finding a job could be so easy. One hour on resume boomer and five days later I had my first interview. Within two weeks I had a job offer. Thanks so much for your help!" 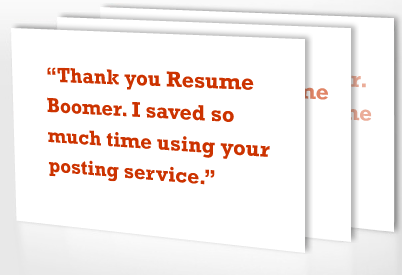 "Resume Boomer was the easiest way I've ever discovered to get my resume out there. In less than three hours my resume was up on every major job site plus a bunch more I never knew existed."